Our media work includes reactive comments on the latest government announcements as well as proactive campaigns – all with the aim of supporting our members and their tenants and bringing about positive change. We can provide spokespeople for media interviews on social housing and its related issues. 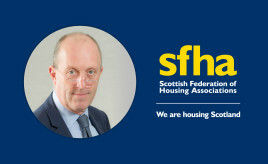 If you have a media enquiry, please contact our Media Adviser, Kirsten Walker by email kwalker@sfha.co.uk or phone 0141 567 6221. Our members are Scottish housing associations, registered social landlords (RSLs), as recognised by the Scottish Housing Regulator.